The congested road between Tooting and Colliers Wood might not be the first place you’d look for a fine local gastropub, but this railway tavern perched above Tooting train station was taken over by the Charles Wells pub company in 2012 and given a major overhaul. In collaboration with the Yummy Pub Company, it now boasts a remarkably ambitious menu of small eats and more substantial main courses. We couldn’t fault either our pie and chips or a club sandwich - though, if anything, the dish presentation was verging on the overly fussy (a bit like the new decor). To drink, there’s a decent selection of ales, and if you’re in the mood for a bit of local cinema, the basement has been converted into a small screening room with blockbuster-style movies such as the ‘Bourne’ series. 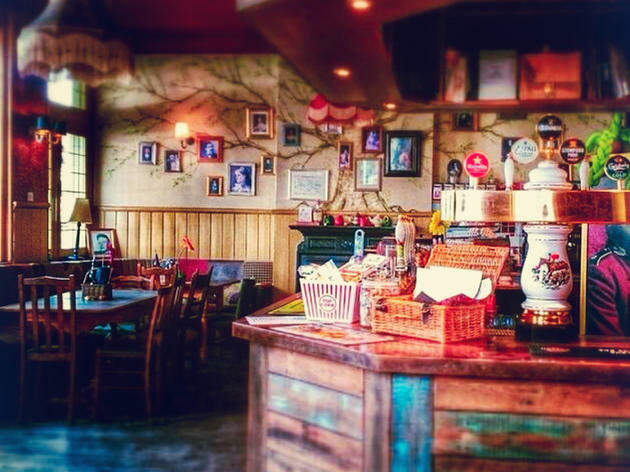 We are the traditional pub with a twist, Tooting’s best-kept secret! Escape home for a few hours and spend time in our cracking pub, where we are changing the shape of the food and drink scene in Tooting, head upstairs to relax in the Library Room or visit our secret boutique cinema in the basement! Love the decoration and ambiance of this pub. Ive organised an event there and the staff was incredibly friendly and I'm sure I'll come back soon. Incredibly friendly staff and very baby friendly during the day. Great pub, where you can enjoy food and drinks in a relaxed atmosphere. Top class service and lovely cinema room. Free cinema downstairs! Comedy and theatre upstairs! Great Sunday roasts. Unique pub and glad it's my local. Let me start by a saying I know I'm not objective. The Gorringe is one of my 'locals' and I love it & whilst I recognise it's flaws I always give it the benefit of the doubt. This visit was an early sat eve family dinner with friends. 4 adults, 5 children. We chose it so the kids could watch a film in the downstairs cinema. In the event the private party ran on & the children never got a look in! The menu has chopped and changed over the years & is now fairly traditional pub food with a few unusual items. All the food we had was delicious. Fish & chips received rave reviews. The kids burgers were gobbled up & I had a really unusual & totally amazing crispy chick salad (was so much better than the name suggests!). The only oddity was a 'Creme brulee' that arrived with a shard of crystallised sugar & a topping of regular sugar. I thought they'd forgot to brulee it, so sent it back! The chef came to personally explain it was a new way of making it, that didn't actually involve 'bruleeing' it! Left me quite puzzled but the dessert was nice despite missing that satisfying crack! The thing that let down this visit was the service, frankly the waitress was away with the fairies. Forgetting to tell us at the start that 3/6 of the main courses were unavailable, Olives arriving after the mains, disappearing for ages, needing to be asked for the bill repeatedly etc! As I said at the beginning, I love the Gorringe & forgive it a lot. It's a great place to spend a relaxed afternoon/evening but go with a huge store of patience! Super friendly neighbourhood pub. Love the basement cinema. Great for a morning coffee and pastry or a pint in the evening. 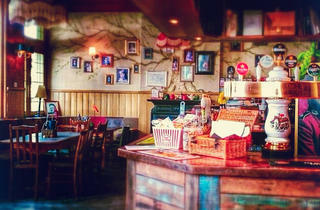 Great food menu, cute little garden, friendly staff and a lovely local atmosphere. It has the look of that pub in American Warewolf in London, when the lads walk in & all goes silent. It's so comfortable inside you almost feel like you're encroaching on the ultimate local where everyone knows each other and you only get accepted after 20 years. Luckily all this is paranoid drivel, the welcome is as warm as the smiles on the faces of the staff and patrons. You feel immediately included and part of The Gorringe club. The decor is so homely you almost go upstairs to bed at the end of the evening before you remember you don't actually live there. Lovely. Tip: Be brave, go upstairs for the free films, and in summer the secret garden is there for the taking! The Gorringe Park has made a tremendous difference to Lower Tooting. It is a real hub for the community & great for people of all ages. A great local, good atmosphere and friendly staff. The cinema is great for a rainy day and the food is well worth a visit. A great local pub with a creative twist. Good beers, friendly staff, great vibe. Love the cinema in the basement (and they're open to screening suggestions and bookings! ), the garden is bijou-funky, the upstairs dining room has a cool Victorian club-style ambiance, the atmosphere is relaxed, and there's an ace comedy club night there every month. Clapham must be feeling jealous. A terrific pub. There's a lovely "local" vibe and the food's quite excellent.